The twelve main meridians circulate in certain rules. Three yin meridians of hand run from the chest to the hand and converge on the ends of fingers with three yang meridians of hand in exterior and interior relation. Three yang meridians of hand ascend from the ends of fingers to the head where they connect with three yang meridians of foot. Three yang meridians of foot descend from the head to the ends of toes where they join three yin meridians of foot; three yin meridians of foot ascend from the toes to the abdomen and chest in which they meet three yin meridians of hand. The three yang meridians of both hand and foot all gather at the head and face, so it is said that “The head and face are the convergence of yang”. A. Yin meridians and yang meridians in exterior and interior relation converge on the ends of four extremities. There are six pairs of yin meridians and yang meridians in exterior and interior relation, each pair converging on the ends of four extremities. The lung meridian of hand taiyin connects with the large intestine meridian of hand yangming at the end of the index finger; the Heart Meridian of Hand Shaoyin connects with the small intestine of hand yangming at the end of the little finger; the Pericardium meridian of Hand Jueyin connects with the shaoyang sanjiao meridian of hand at the end of the ring finger; the stomach meridian of foot yangming connects with the spleen meridian of foot taiyin at the great toe; the bladder meridian of foot taiyang connects with the kidney meridian of foot Shaoyin at the little toe; the gallbladder meridian of foot shaoyang connects with the liver meridian of foot jueyin at the hairy region of the great toe. There are three pairs of yang meridians of hand or foot with the same name, each pair converging at the ends of four extremities. The large intestine meridian of hand yangming connects with the stomach meridian of foot yangming near the nosewing; ithe small intestine meridian of hand shaoyang connects with the bladder meridian of foot shaoyin at the inner canthus; the triple energizer meridian of hand shaoyang connects with the gallbladder meridian of foot shaoyang at the outer canthus. There are three pairs of yin meridians hand or foot converging over the chest. 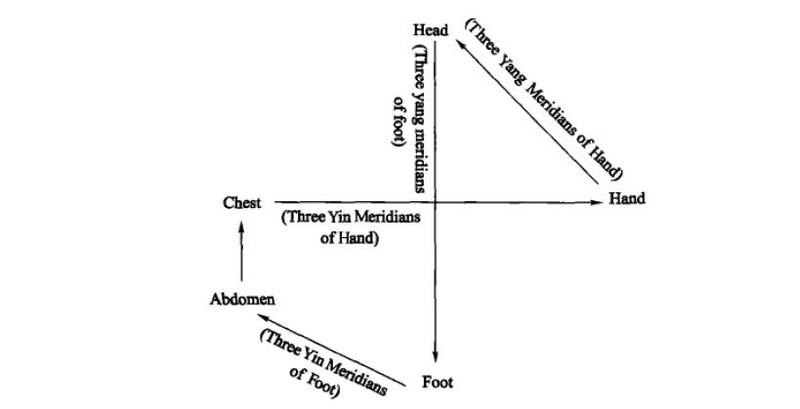 The spleen meridian of foot taiyin connects with the heart meridian of hand shaoyin at the heart; the kidney meridian of foot shaoyin connects with the pericardium meridian of hand jueyin in the chest; the liver meridian of foot jueyin connects with the lung meridian of hand taiyin in the lung. The twelve main meridians distribute either inside the body or on the surface of the body. The distribution of the twelve main meridians inside the body is roughly longitudinal with each meridian curving and crossing in its circulation routes. There are intersections and convergences between the twelve main meridians, the twelve main meridians and their divergent branches, extra meridians as well as collaterals. Despite rare exceptions, intersection refers to the condition in which meridians usually run to the opposite side after crossing with another; convergence denotes the condition that meridians run in their original direction after crossing with another. In this way, there appears various complicated association between each component part of the body, which embodies the holism of TCM. The distribution rules of the twelve regular meridians in the four limbs are as follows: Generally three yin meridians are distributed along the medial aspect of the limbs and three yang meridians along the lateral aspect. Each limb is distributed by Taiyin and Yangming meridians on the anterior border, Shaoyin and Taiyang meridians on the posterior border, and Jueyin and Shaoyang meridians on the midline. It should be borne in mind that in the lower limb, Taiyin meridian crosses and goes in front of Jueyin at 8 cun above the medial malleolus, therefore Jueyin is located in the anterior, Taiyin in the middle. Yangming meridians of hand and foot run through the face and forehead, shaoyang meridians run through both sides of the head and taiyang meridians circulate through the cheek, forehead, vertex and occiput of the head. Three yang meridians of hand run through the scapular region and three yin meridians of hand emerge from the axilla. Of the three yang meridians of foot, yangming meridians run along the chest and abdomen (the front of the trunk), taiyang meridians along the back (the dorsal aspect), and shaoyang meridians along the sides. All the three yin meridians of foot run along the ventral aspect. The meridians running through the ventral aspect from the medial to the lateral are in turn named foot shaoyin, foot yangming, foot taiyin and foot jueyin. As the twelve main meridians run symmetrically along both sides of the body in the chest, abdomen, head and face, back and four limbs, there are altogether twenty-four meridians. Two meridians in exterior and interior relation converge on the ends of extremities, which run respectively along the medial or its comparable lateral side of the limbs. The association of the twelve main meridians with their proper viscera is calied "pertaining”; the association of the twelve main meridians with their viscera in exterior-interior relation is called "linking”. All the yin meridians pertain to zang organs and link with fu organs. A11 the yang meridians pertain to fu organs and link with zang organs. For example, the lung meridian of hand taiyin pertains to the lung and links with the large intestine; the large intestine meridian of hand yangming pertains to the large intestine and links with the lung. The twelve main meridians are the main routes for transporting qi and blood. The circulation of qi and blood follows a regular order. In the sequence of exterior-interior meridians, meridians with the same name and exterior-interior meridians, it starts from the taiyin lung meridian of hand and eventually infuses into the jueyin liver meridian of foot, where it finally connects with taiyin lung meridian of hand. So qi and blood circulate through the twelve main meridians like a cycle without end.